On November 17th, ICCER Steering Committee member, Dr. Erika Goble, spoke at the Alberta Association on Gerontology networking dinner on "Is it Time to Stop Searching for a Magic Bullet? Re-examining the Role of Family-Staff Relationships in Quality Continuing Care". Family/staff relationships are very important in the continuing care sector. 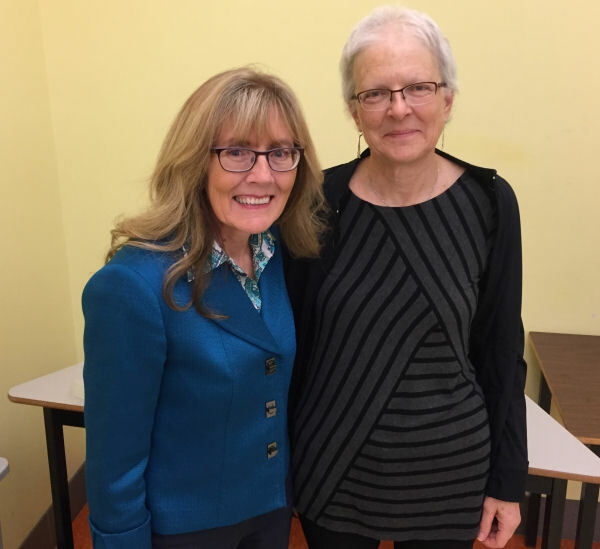 Dr. Goble spoke November 2015 on Family & Staff Perspectives on Behaviours that Support Relationships. Her 2016 presentation built on that presentation by including information from her work in evaluating the implementation of the Butterfly Model with Lifestyle Options, as well as her work on moral distress, compassion fatigue, and a recent examination of front-line experiences of continuing care. In October 2016, Sandra Woodhead Lyons presented Development of a meaningful staff development resource as a participatory activity in continuing care and Community engagement to identify continuing care issues in rural Alberta at the 45th Annual Scientific and Educational Meeting of the Canadian Association on Gerontology: Fostering Innovation in Research on Aging in Montreal. Join ICCER at ACCA’s IQ 2016 Conference September 14 & 15. ICCER will be joining Bow Valley College at their display booth. Come to ICCER and ICCER members! ICCER is celebrating National Seniors Day by hosting two networking events (Calgary & Edmonton) to discuss how to make person-and family-centred care more than just another task in your daily routine. Calgary Networking Event – September 26th, Vernon Fanning Centre, 722 16 Avenue NE. Time 2:00PM-5:00Pm. Join us for discussion, networking, and snacks. Registration required. Edmonton Networking Event – October 6th, Room 4-036 Edmonton Clinic Health Academy, 11405- 87 Avenue. Time 9:00AM – 1PM. Join us for discussion, networking, and lunch. Registration required. On September 26, 2016 ICCER and our Calgary-based member organizations, Bethany Care Society, Bow Valley College, Carewest, Extendicare, and Wing Kei Care Centre, are hosting a networking event focusing on How do we make Person-Centred Care more than just a task? Speakers will discuss the philosophy behind Person and Family-Centred Care, examples of how it has been implemented within the continuing care context, and its potential challenges. An opportunity to network over coffee and snacks included. Join ICCER and the Department of Human Ecology, University of Alberta, on October 6, 2016 for our 5th Speed Networking Event. We will be celebrating National Seniors’ Day by discussing Person and Family-Centred Care. With real examples, life stories, and aha moments, Tanya Hostyn and Sherry Schaefer will show how CapitalCare is making Person-Centred Care something to live, not just one more thing to do. An opportunity to network over lunch included. Can Cooperative Learning Strategies Lead to Practice Change in Continuing Care? The Executive Director of ICCER met with the Executive Director of the Atlantic Institute on Aging in Fredericton, New Brunswick. The two institutes have collaborated for the past several years. The Executive Directors reaffirmed their commitment to working together. ICCER welcomes new member Sherwood Care. Westlock Continuing Care Community Consultation scheduled for May 18th was cancelled due to issues related to the forest fires. We hope to reschedule at a later date. The evaluation of the first 7 years of ICCER was completed by BIM Larsson & Associates at the end of March. Both the Full report and Executive Summary are available. Join the Institute for Continuing Care Education and Research and our partners, Alberta Centre for Sustainable Rural Communities and Alberta Health Services, to talk about continuing care is your area of northern Alberta. Registration is required for these free events. Lac La Biche and area (includes Boyle, Vilna, Athabasca, and neighbouring communities) on April 27th. Westlock and area (includes Barrhead, Swan Hills, Onoway, Mayerthorpe, Clyde, Fawcett, Flatbush, and neighbouring communities) on May 18th. Edson and area (includes Hinton, Jasper, Grande Cache, Fox Creek, Whitecourt and neighbouring communities) on June 23rd. ICCER welcomes our newest members, Carewest and Extendicare.